"The plum blossom" appearsa lotin the works of Chinese painting,meanwhile, it is also a representative flower of China, but it is extremely rare in the oil painting, in a sense,this is also the author daring innovation.In the screen, the inventive composition method will let the audience feel different in the overall perception. Through this kind of composition, the author wants to express the tenacious spirit of plum, it grows from a trunk to all directions, and its shape is special, especially several small branches, bending and tough, appears to be very powerful, the exquisite detailed portrays make the trees very realistic.Because the theme of the painting is plum, the color is more abundant. 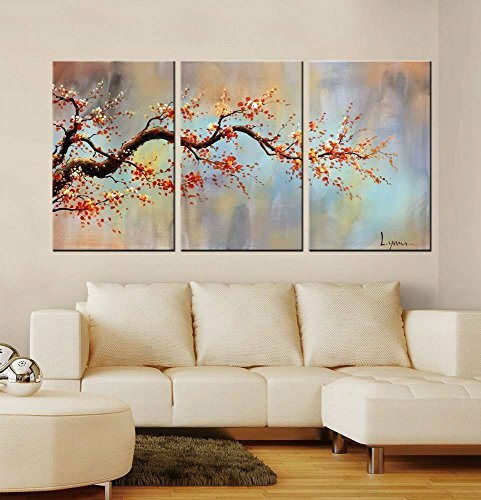 The author used several bright colors such as white, orange, orange red and so onto show the plum blossom in different perspectives, which makes the picture beautiful and full of vitality. Even in the winter, the plum still blooms, so it stands for the valuable quality of the Chinese nation like indomitable, tenacious struggle and brave spirit, although the growth environment is harsh, but it still blooms happily, so the author also intended to expressan optimistic, positive and progressive spirit.